St. Patrick’s Day will soon be here! Do you decorate for this holiday? Some people enjoy making their home festive for each and every occasion. Today, we have gathered up some fun and inexpensive St Patricks Day decorations that you can create on your own to make your home look like it bleeds Irish. You can make a simple an easy shamrock garland by cutting out shamrock shapes on green paper. If you are not good at drawing shamrocks freehand, you can print out a template on Google. Once you have done that, cut out circle shapes on gold glittery paper. If you do not have glittery paper on hand, you can add your own glitter. Then, get some string and tape or sew your shamrocks and glitter ‘coins’ onto the string. Voila! You can make adorable leprechaun hat decorations out of small terracotta pots. Paint your terracotta pots green and allow them to dry. Be sure to use the kind of paint that is specifically for terracotta pots. Next, add a black ribbon to the base of the pot. Either add a small gold buckle or create your own with paper and attach it to the black ribbon. Finally, add a small green shamrock (real or made out of paper) to complete the decoration. If you have green Christmas balls laying around somewhere, gather them up (ideally in various shades of green) and place them in a clear plastic or glass jar. You can even add white or green lights to the jar. Create coffee filter shamrocks with coffee filters, green pipe cleaner, green food coloring, and water. Pinch the coffee filter together into a shamrock shape. Then wrap a pipe cleaner around the shamrock leaves so that it holds it shape. 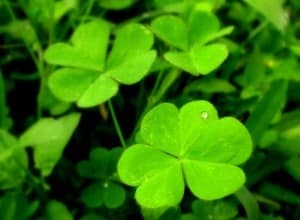 Next, dip the shamrock in cold water and gently squeeze out the excess water. Finally, place a few drops of green food coloring at the ends of each ‘shamrock’ leaf. Allow your shamrocks to dry. Then display them in a vase or wrap them around various items in your house.